Daniel McIntyre spent 43 years as Winnipeg School Division Superintendent bringing wisdom, imagination and innovation to the Winnipeg school system. The school bearing his name is an appropriately handsome tribute with an evident sense of history. 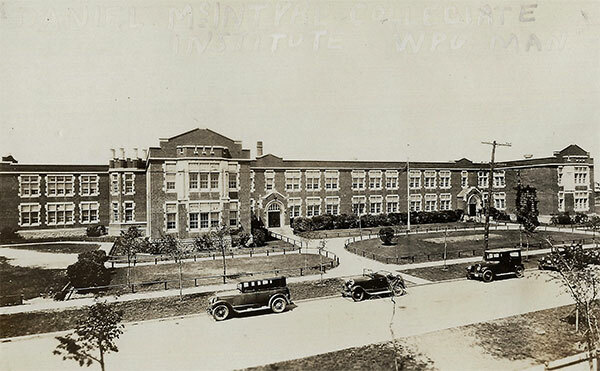 In 1922, the School Board asked architect Colonel John N. Semmens to design the school. 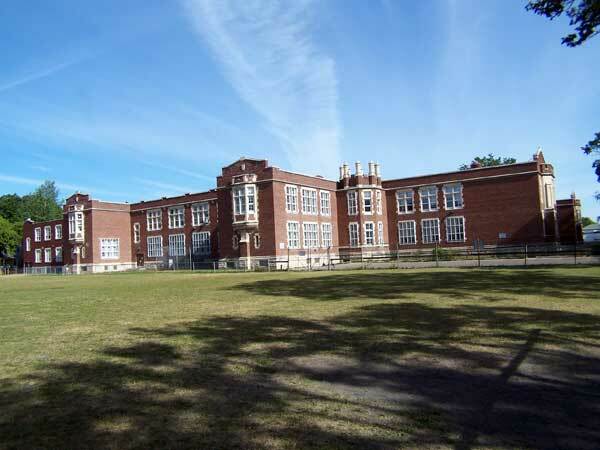 Semmens viewed Daniel McIntyre Collegiate as the most important school in western Canada. Set on a limestone foundation this massive, two-storey school is a variation on Gothic Revival style known as Collegiate Gothic when used for educational institutions. It is loaded with Gothic details like the stunning entrance from the quad (above left) which features a smooth limestone peaked arch with Gothic tracery and quatrefoils over the door. Noteworthy former students include 1950s Blue Bomber Cecil Luining (four Grey Cups), Winnipeg Mayor Bill Norrie, CPR President and Senator Ian Sinclair, Lieutenant Governor George Johnson, Premier Howard Pawley, bandleader Marsh Phimister, Guess Who guitarist Kurt Winter, painter/sculptor Bruce Head, singer/songwriter Stewart Fay, Blue Bomber Markus Howell and NHLers Ernie Dickens and Paul Platz. Others included scientist and author Dyson Carter, musician Ross Pratt, actor Evelyn Morris, author and poet Cherry Crawford, violinist Fred Grinke, opera singer Brenda Bennett, and author Olive Elsie Knox. Group of Seven artist Frederick Varley painted a large portrait of Dr. Daniel McIntyre, which was presented to the school in 1940. Today the painting hangs imposingly in the school library. The building is a municipally-designated historic site. Christopher T. Best, Minnabell A. Dowler, George Florence, William Astley Tearle Fyles, Elsie Moore, Harold E. Riter, ? This page was prepared by Gordon Goldsborough and Reid Dickie.